Your wedding day does not start with the ceremony. It actually starts hours before as you and your bridal party arrive at your getting ready location to be pampered by your hair and makeup team!. These are the last hours you will get to spend with your girlfriends as a “single lady” and a great time to make lasting memories with the women that have been so important in your life. So why not spend this time in style? Brides all over the country have jumped on board with the trend of donning adorable outfits to get ready in, and we here at Magnificent Moments Weddings LOVE IT! Today I wanted to share 5 cute getting ready outfits to inspire your very own pampering session! These adorable rompers feature delicate lace trim that is the definition of feminine. It comes in white, pink, mint and navy blue and con be personalized further with monograms or names. Plus the wide neck makes it easy to remove without messing up your newly set hair or makeup. These super comfy shirts will make wedding day prep feel like a relaxing day on the couch. They are oversized so you’ll have plenty of room and they button up to save from a hair disaster. Plus they come in 3 adorable colors: mint, pink and blue, and can be monogrammed. Your bridesmaids will wear this for years to come! Pro tip: Make sure the length of your robe is long enough for all of your ladies, or choose a style that looks great with black leggings! Hanging out with you girls friends is meant to be fun so why not spring for these super fun oversized tees. 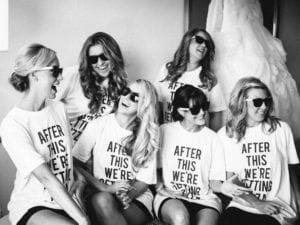 They have great quotes including “NO PANTS ARE THE BEST PANTS” and “AFTER THIS WE’RE GETTING TACOS” that are sure to have your bridesmaids laughing all the way to the aisle. This cute pj set has a dreamy floral pattern that screams wedding chic! Made of cotton this matching set comes with a button up top and stretch waist shorts. Your bridesmaids will love lounging around in these comfy pjs and your pictures will looking nothing else but stunning. Need any help planning your wedding? Contact Magnificent Moments Weddings, we’ve got you covered!